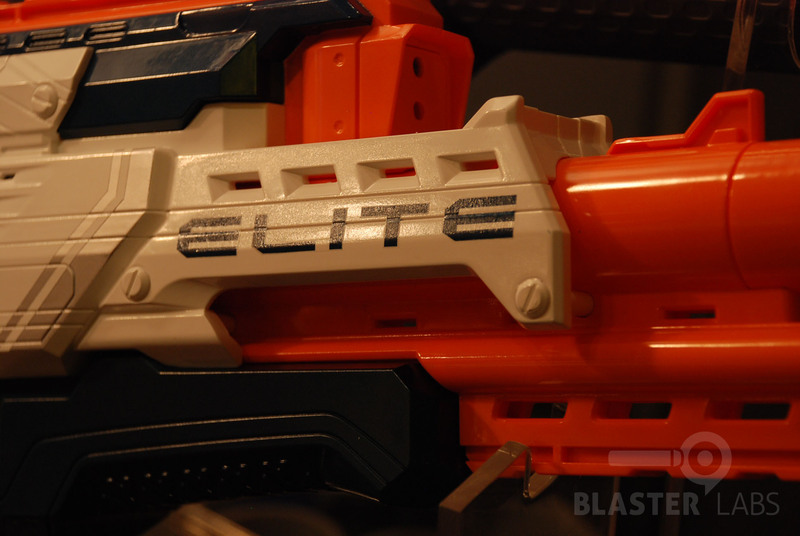 Let’s get this out of the way: the N-Strike Elite Nerf Cam ECS-12 is the new blaster no one asked for, at a price no one seems interested in paying, and with technology no one believes is appropriate for a device released this decade. 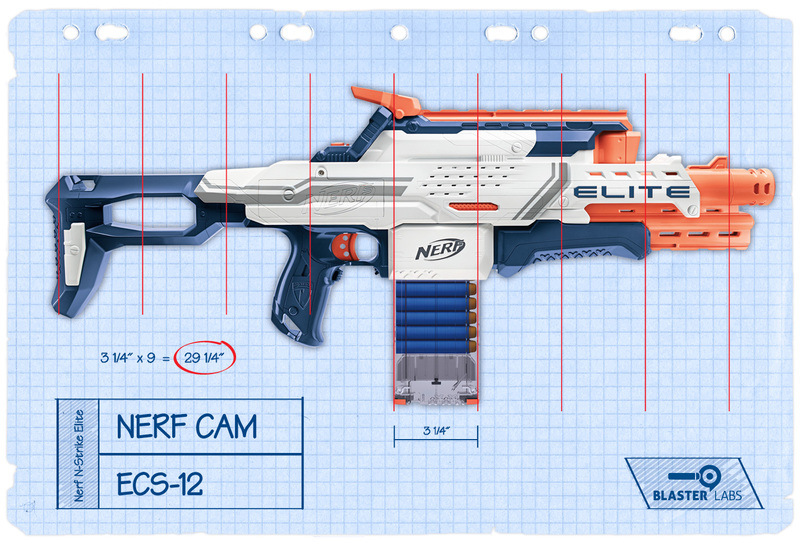 Nonetheless, the new Cam ECS-12 is very likely the “mystery blaster” that UK Nerf spotted at the UK Toy Fair, and according to Engadget, may indeed be Nerf’s “big ticket” item for the year, despite widespread hopes and dreams of something more spectacular. Having now had a week to recover from the disappointment felt at the near-complete lack of new product announcements from Hasbro during Toy Fair 2014 (other than confirmations of products previously announced or otherwise leaked online), we decided it would be appropriate to take a step back and reflect on what exactly is coming our way later this year—to consider some of these products on their own merits, versus merely dismissing them for not having met our collective (and lofty) expectations. Single, 0.3 megapixel camera can take photos or non-HD (320×280) videos at 20 frames-per-second. 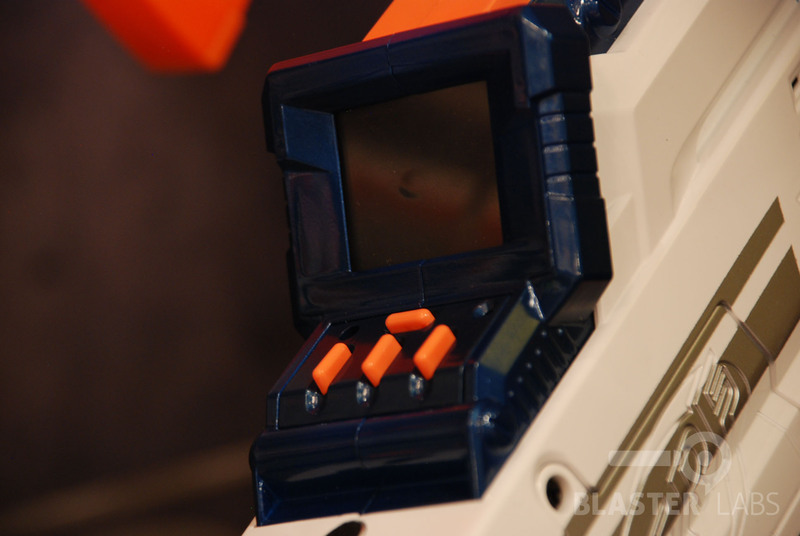 Features a 1.77” screen that displays crosshairs for aiming. Videos can be played back and deleted, and has a purported 3 hours of recording time or 2,000 images on the standard 4GB SD card (card slot is located below the camera playback buttons). Recording end of camera captures iron sights, but doesn’t allow for any tactical accessories or manual sighting via the front of the blaster. Button just below barrel on left-hand side starts and stops video recording. 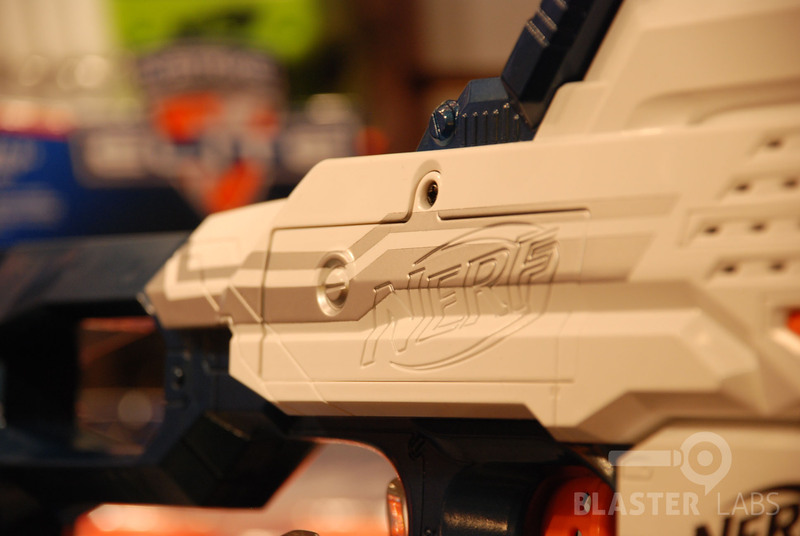 Glare-guarding hood over camera screen shown in initial renderings was absent on the Toy Fair prototype, suggesting this blaster is still undergoing revisions. Two tactical rails are present: one located in the front under the barrel, and the other on top of the camera pod. Single handgrip is provided in front of the ammo clip, and does not appear to serve any purpose other than providing a means to support the front of the blaster and aligning the hand for turning the camera on/off. Clear, 12-dart clip will be standard. Acceleration Trigger is located below the firing trigger, across from the clip-release button. Unlike other “ECS” blasters that are fully automatic, the Cam ECS-12 is semi-auto, only (presumably due to weight issues). Two separate doors hold a total of 8, AA batteries: blaster and camera each require 4 AA batteries to function. Fixed (and seemingly non-adjustable) shoulder stock is fitted as standard. Two strap mounting points are provided: one in the handle, one in the shoulder stock. Muzzle is not compatible with barrel extension attachments. Using Elite darts, range is claimed to be 90 feet (versus 75 feet for current Elite models). Predominantly white, blue and orange color scheme with large “ELITE” branding is new to the product line. 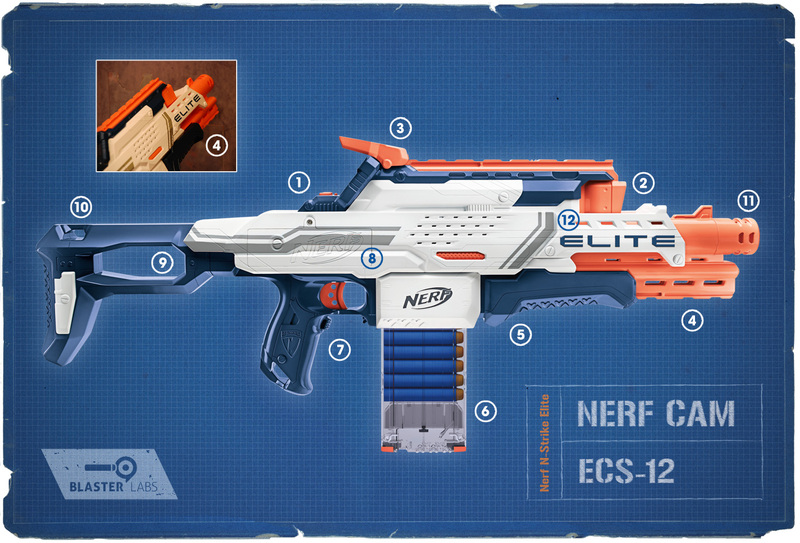 Even after a more thorough review (and in notable contrast to our review of the Demolisher 2-in-1 Blaster), we frankly don’t see the Nerf Cam ECS-12 as a particularly interesting or ground-breaking addition to the Elite product line. The camera is indeed a neat idea, but would be much better as a stand-alone tac-rail accessory (of which there are relatively few). It also raises the price of what is otherwise essentially a $15 Stryfe re-shell with a spec-bumped motor to a stratospheric $80 price-point. Apart from the novel (but low-spec) camera, one is basically left with an overly-large, overly-expensive, amped-up Stryfe with little to no modularity of flexibility. 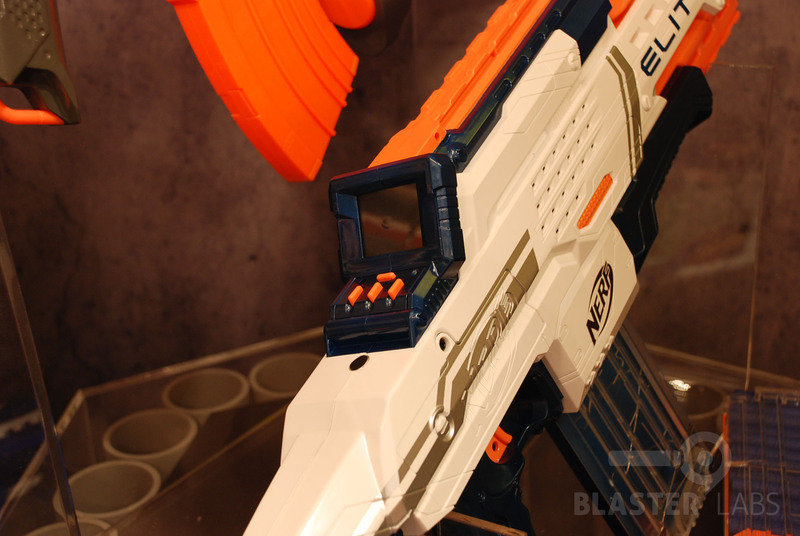 It’s rare that we say this about a Hasbro product, but even upon closer inspection, we tend to agree with the current consensus among the Nerf Internet Community: the Nerf Cam ECS-12 simply misses the mark. It fails to be the flagship product we were hoping for this year (a battery-powered Mega product would have been more noteworthy), nor does it significantly advance the current product line. 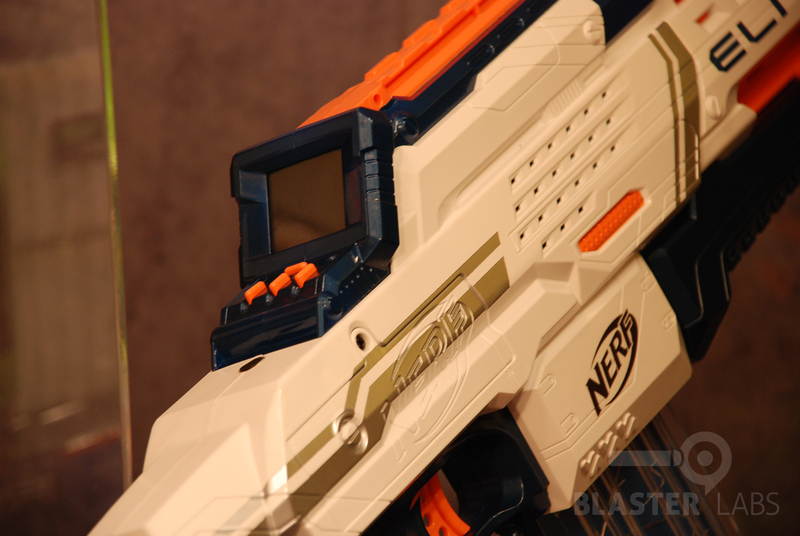 As a tac rail accessory, the Nerf Cam would have been an add-on worthy of consideration (particularly since it could have been added to any Nerf blaster one currently owns). 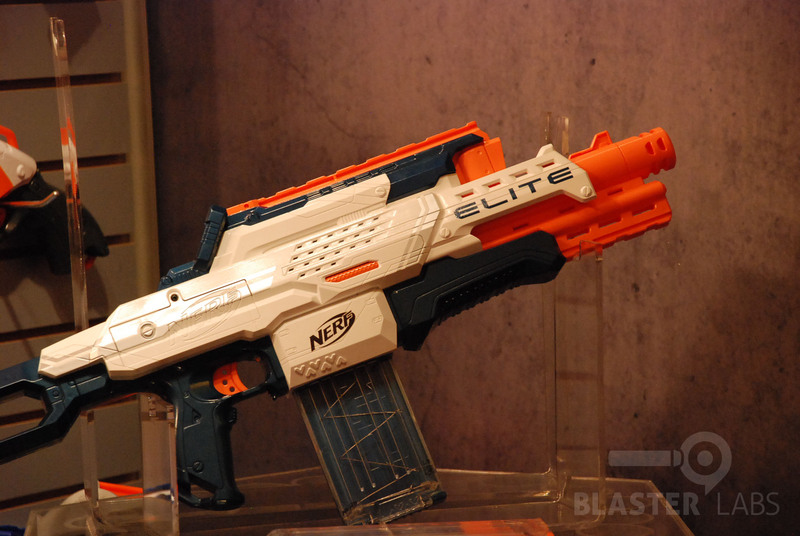 But as a high-dollar blaster, we’re not sure the Cam ECS-12 can justify its own existence. We’re looking forward to trying one out later this year to see if we’re wrong. 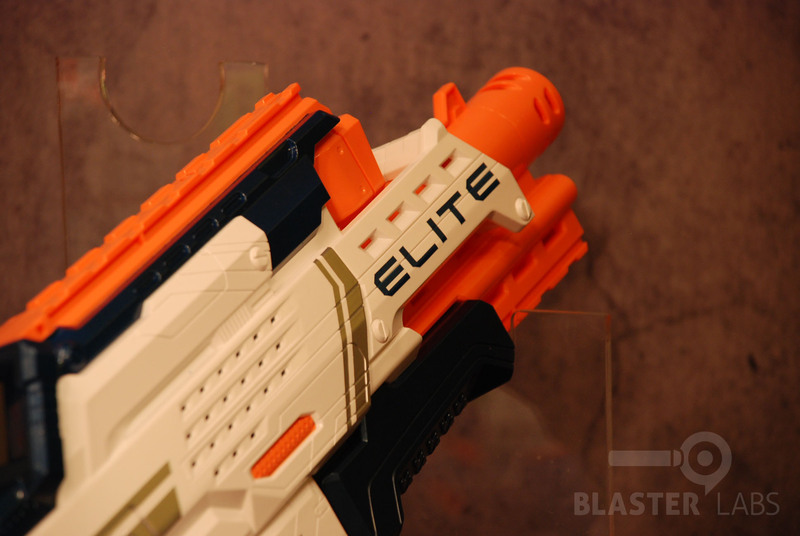 This entry was posted in Dart Blasters, News/Updates and tagged blaster, Cam ECS-12, elite, n-strike, nerf on February 24, 2014 by PMindemann. Can you say from first hand experience whether the dark color on the handle, grip, etc. 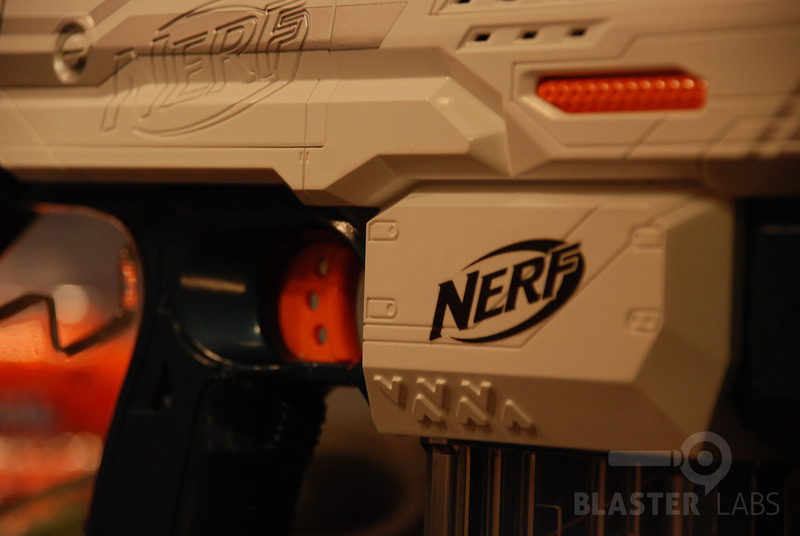 is dark grey or dark blue like the previous nerf super soaker line? It’s been annoyingly hard to tell from online photos. It’s definitely dark blue. Whether or not it precisely matches previous blue colors may be debatable. But the handle, front grip, shoulder stock, etc. are all dark blue. 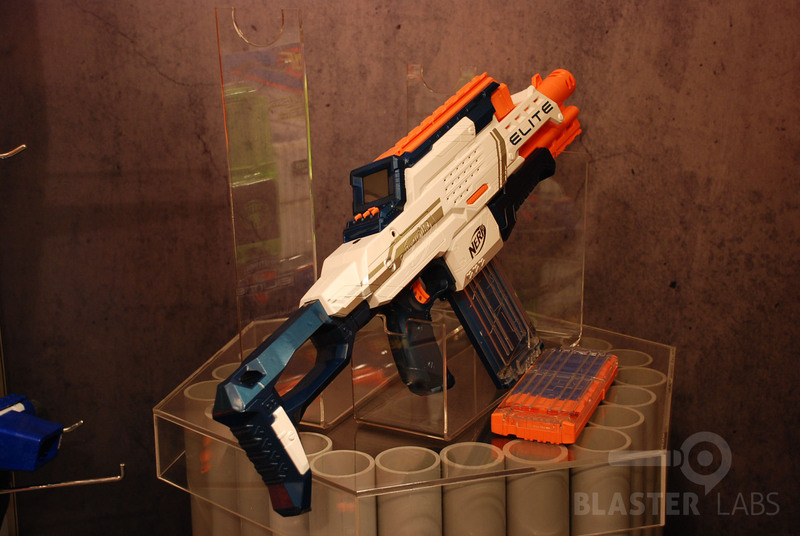 We were told this white/blue/orange scheme will be showing up a lot going forward, though we did find it interesting that other new blaster, like the Demolisher, were predominantly orange. Really hope the improve the camera & screen resolution before this comes out. Other than that, this thing looks really sweet.